Latinos are murdered twice as much as whites in California — and more by strangers. Latinos are more likely to be shot and burglarized than whites. Hate crimes against Latinos rise as immigration increases. California Latinos experienced more repeat crimes than survivors overall. Half of Latino survivors are unaware of recovery services. Latinos awaiting trial were more likely to be denied bail, or their bail was set higher than African Americans or whites. 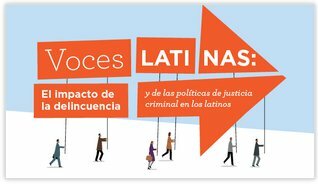 Latinos were 44% more likely to be incarcerated than whites for the same crimes. They want more supervised probation and rehabilitation by a five-to-one margin over sending more people to jail/prison. Eight in 10 support shortening long sentences and using the savings for education, health services and prevention.